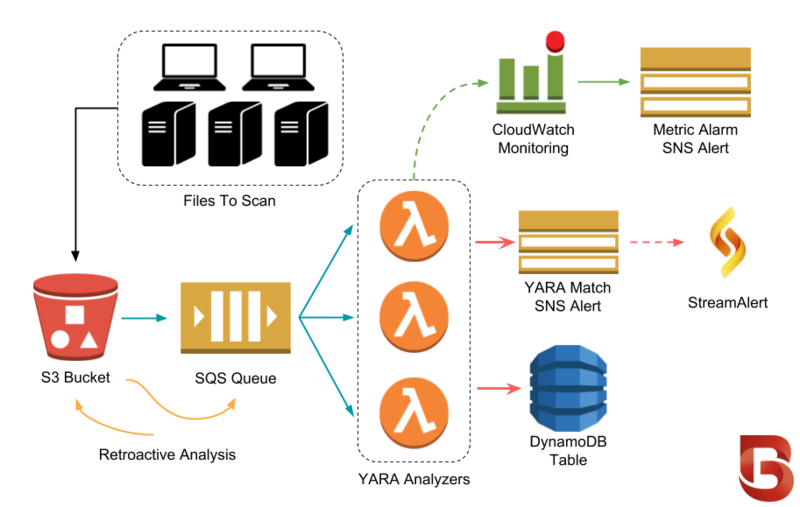 BinaryAlert utilizes a serverless architecture which is low-cost and easy to scale and maintain. While it’s helpful to understand how BinaryAlert works, keep in mind that Terraform manages all of these components so you don’t have to! Every file uploaded to the S3 bucket is immediately queued for analysis (using S3 event notifications). The SQS queue automatically batches files and invokes many analyzers in parallel. YARA matches are saved to DynamoDB and an alert is sent to an SNS topic. You can subscribe to these alerts via StreamAlert, email, or any other supported SNS subscription. For retroactive analysis, the CLI will enqueue the entire S3 bucket to be re-analyzed.